Like Guided By Voices with a soured edge, LVL UP hammer in tight, witty songs that usually fit inside the space of a minute or two. A brilliantly toothy romp, the New York band's debut LP Space Brothers still holds a spot among my favorites of 2011. We recently saw the mini-clip to the micro-single "Nightshade" off that record. Now, LVL UP are finally set to release the followup. 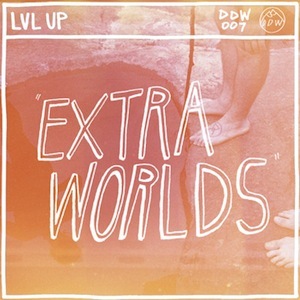 We're proud to present the second official track off of LVL UP's forthcoming Extra Worlds EP. A spunky drama in two acts, "Trial One" winds down into a mid-song fakeout only to blast back to a second ending that topples over the first. Following the gutteral "Graveyard", the track's yet another good sign of things to come from the 7", due out April 6 from Double Double Whammy.